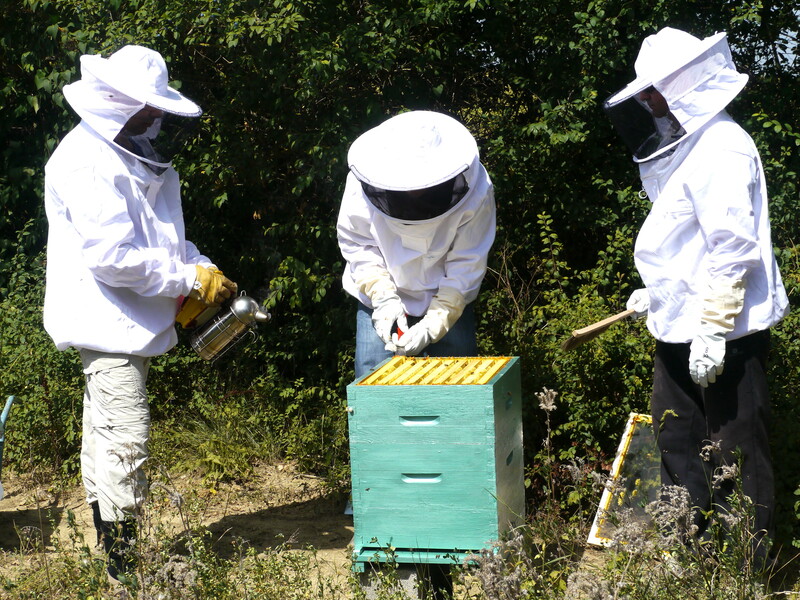 Having ditched the disguises, and made it hot foot round to the safe house (JP’s office), giving the bees the slip, we start to unload the treasure and the necessary equipment, ready to move in to Stage Two of the operation – the Extraction. JP has been tooling-up and amassing the requisite tackle, to be co-owned by us and new crew member, Vincent. The key piece of machinery is the Extractor. This is a drum, containing three cages, each of which will hold a frame. Ours is hand powered, the handle is turned to start the frames spinning, and the honey is driven from the cells by centrifugal force. 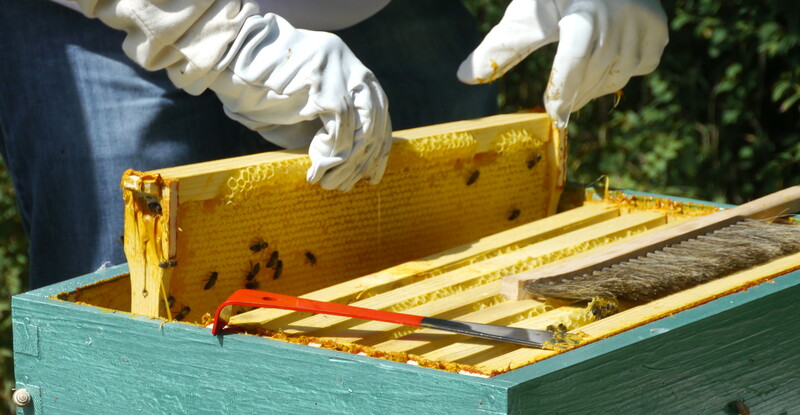 Other equipment is a long, serrated knife for uncapping the honey cells, and a large plastic tub over which the frame is worked. 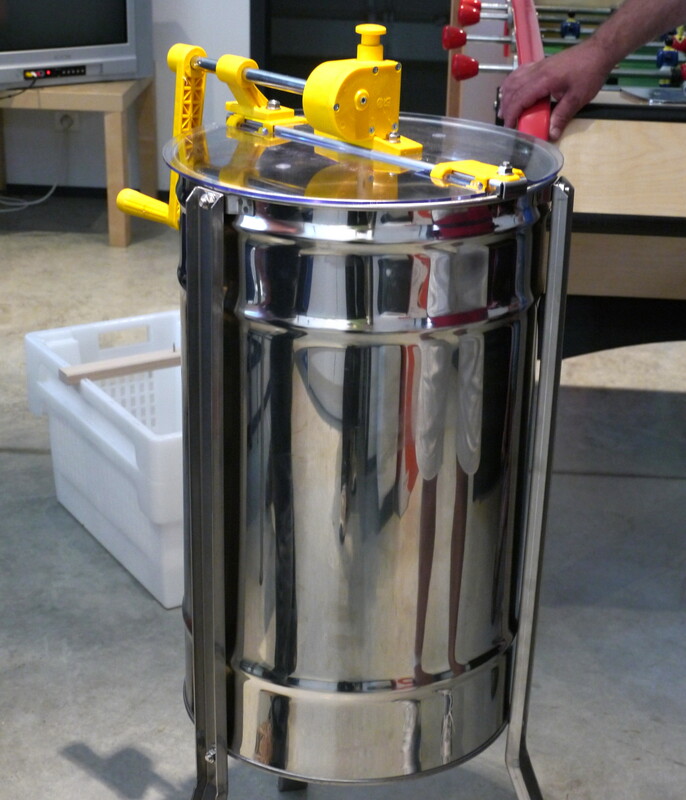 This is to catch any honey drips and bits of wax (aka cappings). 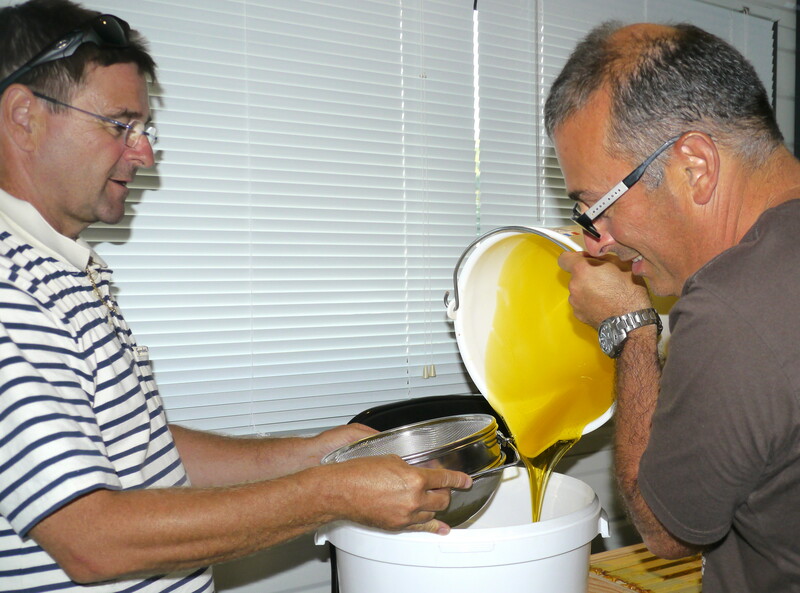 The frames are still warm (its about 35 degrees outside), and uncapping the honey is a delicious, exciting moment, as the deep yellow, sticky liquid oozes from the cells. The first attempt at removing the top cover of wax is rather gung-ho, and we realise that more of the cell has been destroyed than is strictly necessary. The technique however is soon refined, and the first three frames loaded into the extractor. 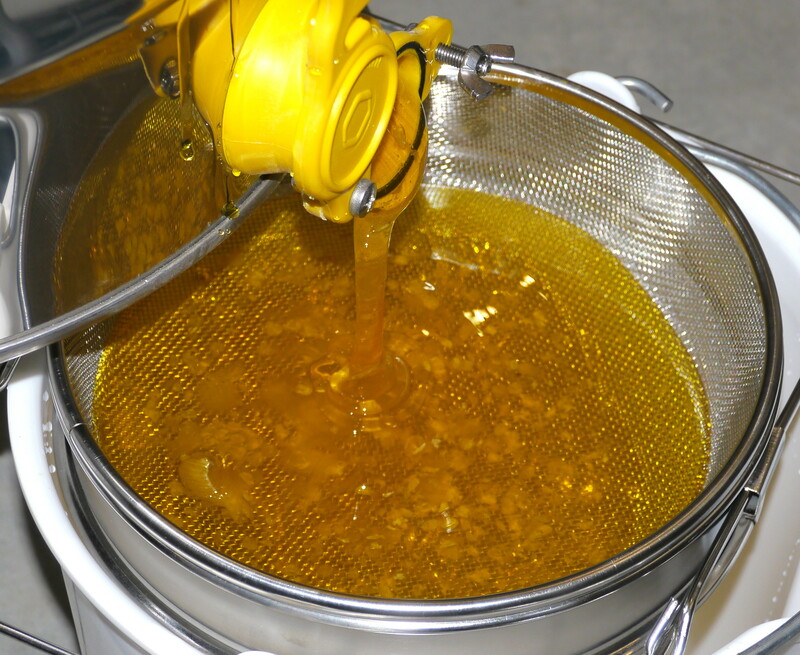 This is put into motion, and the honey starts to pool at the base of the extractor. When all nine frames have been processed, the tap is opened and the honey literally gushes out. It is passed through a filter and into a bucket. 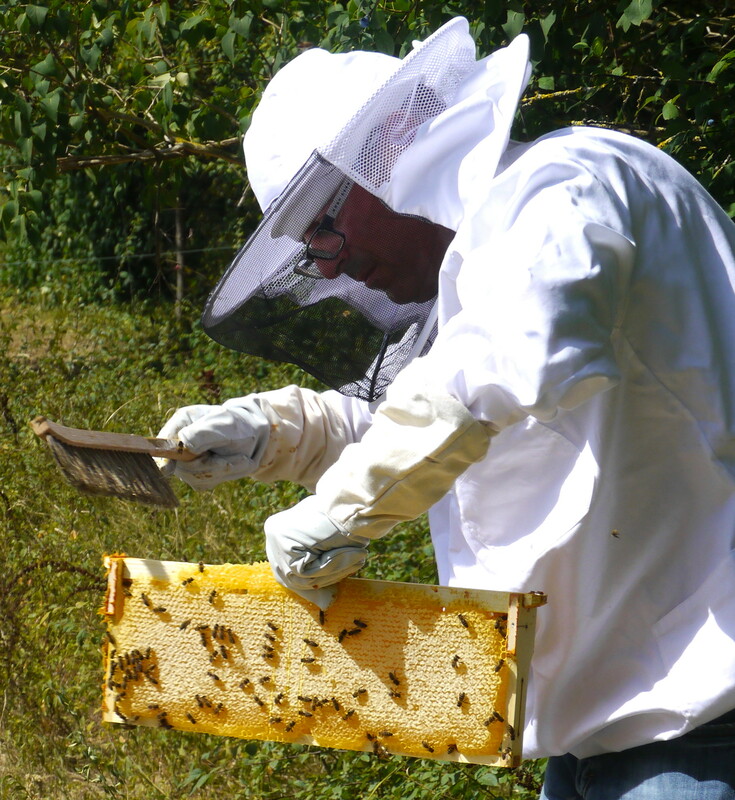 At this moment, it would have been rude not to have dived for the teaspoons and savour the freshest, tastiest honey ever. The filtered honey is then decanted into The Maturateur – a posh name for a tub with a lid and tap, where the honey is left for a few days to settle, to get rid of air bubbles and bits of wax. The weigh-in shows a very healthy yield of 15 kilos. So, a job well done and time to celebrate. There was a small matter of a sticky floor to clean, and then we rushed back to the house, stopping at the cheese shop, so that we could sit and relish the very first pot of Jean-Philippe’s very own honey. The sunflowers have started to go dark brown and crispy – which pretty much signals the end of the honey season. 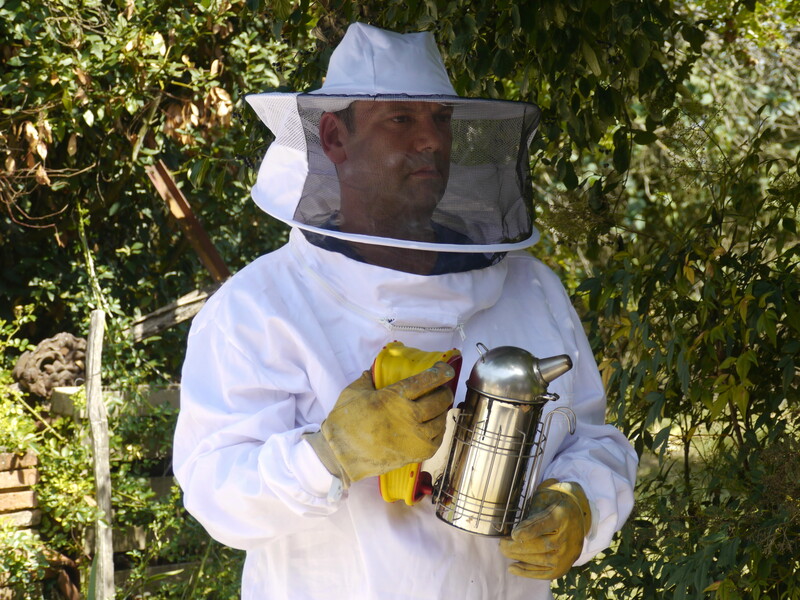 It is time to remove the super, and crack on with out first honey harvest (deep joy). 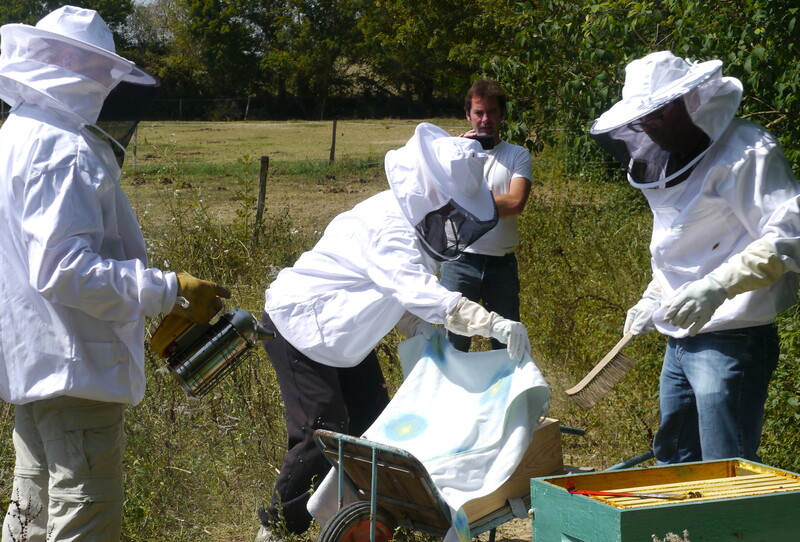 We are starting with JP’s hive. This hive is a couple of weeks in advance of mine, plus the sunflowers around my house were planted late – and there is still evidence of bee activity. 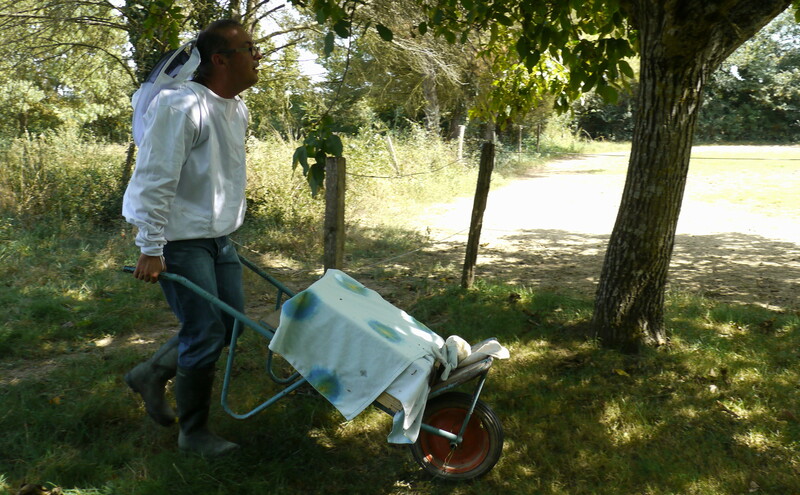 The afternoon is hot and dry – ideal conditions for relieving the bees of the fruits of their labour. To be fair, we are only taking a share of the spoils ~ and leaving them plenty for winter. So, in return for providing them with rather excellent accommodation, we help ourselves to some rightful recompense, even if the bees are none too happy or indeed compliant with this arrangement. Its a stick-up! Your honey, or your life. It is deemed best to wait until most of them are out, and to go in disguise. We have a new collaborator, Simon, who is on Smoker Duty, plus a couple of paparazzi (Kim and Vincent). JP is leading operations, with Andy aiding and abetting. JP has a new, empty super – and is going to transfer the frames one by one from the active super. 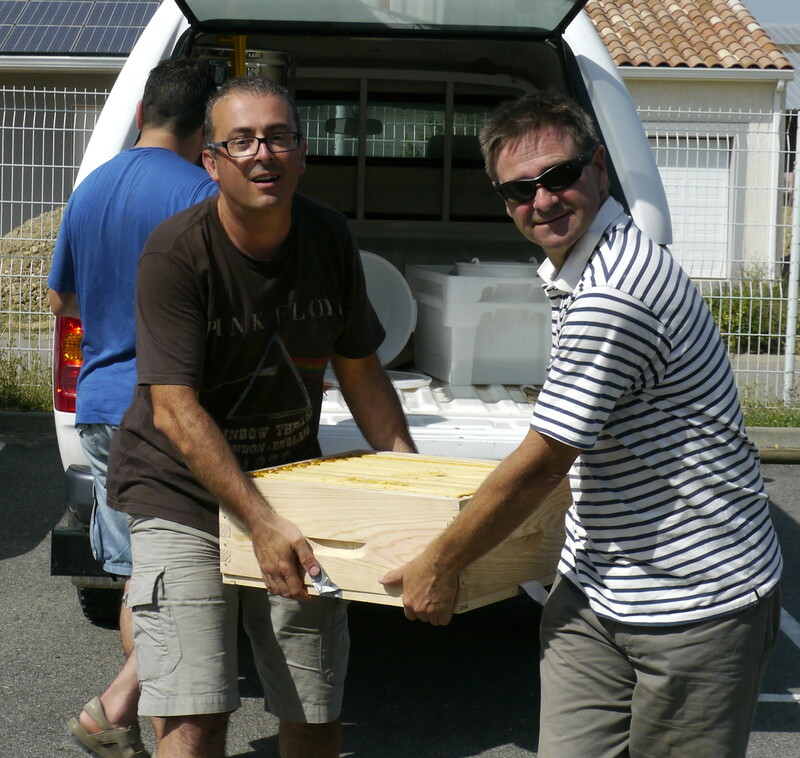 A few puffs of smoke, a bit of leverage from the beekeeper’s crow bar to break the propolis glue, a gentle brush – and the frames are quickly spirited away to the awaiting getaway vehicle, where they are convincingly draped with an old blanket. The bees barely notice. The frames are remarkably heavy, and it promises to be quite a heist. All nine frames nicely pilfered, the team pack up pronto, and speed off to transfer the booty to a second getaway vehicle – wanting to transform the evidence as quickly as possible. Looks like we have pulled off Stage One of a successful non-Sting Operation.